I created this print for the people who helped me raise funds for my trip to Peru with Healer2Healer. These two children were at our clinic everyday, the young girl was very curious about the acupuncture and the reiki going on in her village. She hovered around the edge of the clinic while we worked—she greeted us every morning, and said good-bye to us every evening. I am still processing this trip—there are so many levels of adjustment. First, just the aspect of giving healing energy and having it openly received is so beautiful; second, the amazon jungle is so full of life and healing and danger and sensuality—there is an enchanted energy there that seems to be lost on the western world; third, the power of the plant medicine that I learned about and experienced is still reverberating throughout my consciousness. It is so apparent that whatever we do (especially as a collective here in the states – but even as individuals) has a ripple effect all around the world. I feel much more relaxed about my own existence and my ability to live in a good way. I feel like I went to a core place in my own being, am emerging slowly, but everyday am picking up speed—and I am ready for it. Some of these prints are for sale. I am donating 10% of the sales to Healer2Healer, so that they may buy supplies, etc., for their upcoming journeys around the world. Hopefully in the near future, I will be able to join them again. 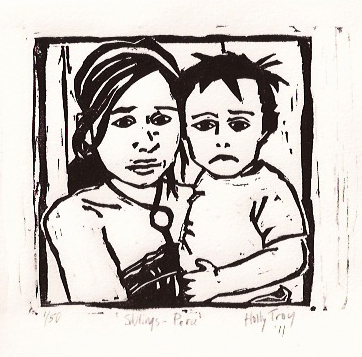 The print is an original linocut, pressed by hand with a brayer. (It is the same process as a woodcut, but rather than using wood, I used linoleum to cut the design). It is made with archival printing ink and is on Arches BFK acid-free paper. The image with signature measures about 4″x4″. I think creating this piece in a slow, laborious manner, helped me to ground my experience even further.